On August 4, 1914, Britain declared war on Germany. Canada, as a member of the British Empire, was automatically at war, and its citizens from all across the land responded quickly. A month after war broke out, 32,665 volunteers arrived at the new camp at Valcartier, Quebec, in 100 special trains. Thus began the growth of the colony's peacetime army from a pre-war force of 3,110 regular and 74,213 part-time militia members. By the end of the war, Canada would have 619,636 service people in uniform, including more than 3,000 Nursing Sisters. The tiny peacetime force would grow nearly tenfold. It was a huge army for a population of less than eight million. Four long years of war would transform Canada from a colony to a nation. At a cost of nearly a quarter of a million casualties—one in four of them fatal—Canada would grow, with sorrow for the fallen and the maimed, yet with a new pride and a more confident awareness of nationhood. It was a heavy price for national identity and peace in the world, a price Canada would pay again 20 years later and in the troubled years beyond. Eventually, Canadians would become peacekeepers to the world. Instead of fighting to restore peace, they would stand between combatants to preserve it. This prime military role supports Canada's foreign policy to this day. Canada's major military contribution to what was called the Great War— the war, to end to end all wars— was the 100,000-strong Canadian Corps. Its members were stationed on the Western Front, that jagged chain of trenches dug into the mud and clay of France, stretching 966 kilometres from the Belgian coast to the border of Switzerland. Here armed soldiers faced each other over the shell-torn, muddy and decaying landscape of No Man's Land. Daily, they were confronted with the cruel realities of disease and death. For most of those years, the front line scarcely moved, except a few metres at a time, gains that were hard-bought by continual courage and dogged endurance. Almost until the end, the Great War was fought as siege warfare, rather than a war of movement. It was very costly in terms of lives and wounds. In this largely static war of attrition, the Canadian Corps came to be valued as one of the most effective military formations on the Western Front, for they were masters of the grim and hazardous techniques of offensive warfare. Their first full-scale demonstration of this came in April 1917 at Vimy Ridge, which they captured with superb planning and preparation, resulting in casualty levels far below the norm. Vimy was the pinnacle of Canadian military achievement in the First World War. Vimy Ridge was a key to the German defence system. Rising 61 metres above the Douai Plain, it protected an area of occupied France in which mines and factories were in full production for Germany. It was a linchpin covering the junction of the main Hindenburg Line and the defence systems running north to the coast of the English Channel. Since capturing the Ridge in October 1914, the Germans had been building fortifications to add to its natural strength and dominance. 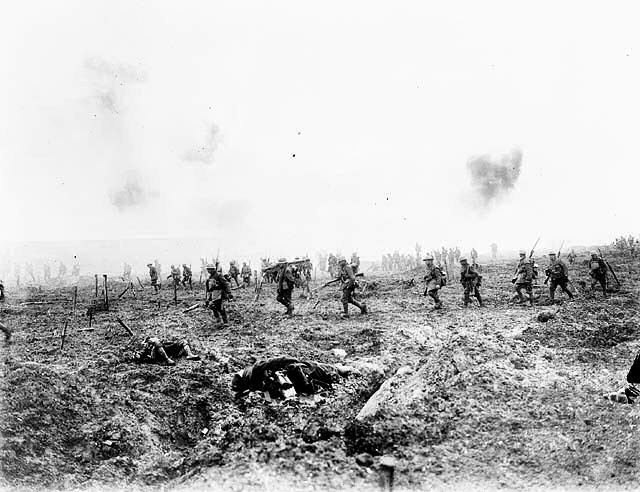 The slopes of Vimy Ridge favoured the defenders. Because the incline on the west was gradual, many of the Canadians would have to attack over open ground, where they would be prime targets for artillery, machine-gun and rifle fire. They would face three main defensive lines, consisting of a maze of trenches, concrete machine-gun strong points that had hedges of barbed wire woven around them, and deep dug-outs, all linked by communication trenches and connecting tunnels. As well, there were vast underground chambers, some capable of sheltering entire German battalions from Allied shells. At 5.30 a.m., April 9, 1917, Easter Monday, the creeping artillery barrage began to move steadily toward the Germans. Behind it advanced 20,000 soldiers of the first attacking wave of the four Canadian divisions, a score of battalions in line abreast, leading the assault in a driving north-west wind that swept the mangled countryside with sleet and snow. Guided by paint-marked stakes, the leading infantry companies crossed the devastation of No Man's Land, picking their way through shell-holes and shattered trenches. They were heavily laden. Each soldier carried at least 32 kilograms of equipment, plus, some say, a similar weight of the all-pervasive mud on uniform and equipment. This burden made climbing in and out of the numerous trenches and craters particularly difficult. Vimy Ridge marked the only significant success of the Allied spring offensive of 1917. The Canadian achievement in capturing Vimy Ridge owed its success to sound and meticulous planning and thorough preparation, all of which was aimed at minimizing casualties. But it was the splendid fighting qualities and devotion to duty of Canadian officers and soldiers on the battlefield that were decisive. Most of them citizen-soldiers, they performed like professionals. Canadians attacked German machine-guns, the greatest obstacles to their advance, with great courage. They saved many comrades' lives as a result. Four won the Victoria Cross for their bravery in such dangerous exploits. Of these, three were earned on the opening day of the battle. Private William Milne of the 16th Battalion won the VC when he crawled up to a German machine-gun that had been firing on the advancing Canadians, bombed its crew and captured the gun. Later, he stalked a second machine-gun, killing its crew and capturing it, but was himself killed shortly thereafter. The whereabouts of Private Milne's grave is unknown. Lance-Sergeant Ellis Sifton of the 18th Battalion charged a machine-gun post single-handed, leaping into the trench where it was concealed and killing its crew. Soon after, he was met by a small party of Germans who were advancing through the trench. He managed to hold them off until his comrades arrived, but then one of his victims, gasping a last breath of life, fired upon him. During the fight for Hill 145, Captain Thain MacDowell of the 38th Battalion entered an enemy dug-out, where he tricked 77 Prussian Guards into surrendering and captured two machine-guns by pretending he had a large force behind him. His large force consisted of two soldiers. MacDowell had earned the Distinguished Service Order on the Somme. On April 10, Private John Pattison of the 50th Battalion jumped from shell-hole to shell-hole until, 30 metres from an enemy machine-gun, he was in range to bomb its crew. He then rushed forward to bayonet the remaining five gunners. Pattison was killed two months later. Of the four Vimy VCs, only Captain MacDowell survived the War. The Canadian record, crowned by the achievements at Vimy, won for Canada a separate signature on the Versailles Peace Treaty ending the war. Back home, the victory at Vimy, won by troops from every part of the country, helped unite many Canadians in pride at the courage of their citizen-soldiers, and established a feeling of real nationhood. ﻿The Memorial on Vimy Ridge does more than mark the site of the great Canadian victory of the First World War. It stands as a tribute to all who served their country in battle and risked or gave their lives in that four-year struggle. ﻿Designed by Canadian sculptor and architect Walter Seymour Allward, the Vimy Memorial stands on Hill 145, overlooking the Canadian battlefield of 1917, at one of the most fierce fighting battle points of the war. It took 11 years and $1.5 million to build and was unveiled on July 26, 1936 by King Edward VIII, in the presence of President Albert Lebrun of France and 50,000 or more Canadian and French Veterans and their families. In his address, the King noted, "It is a memorial to no man, but a memorial for a nation." monument is raised by the people of Canada. le peuple canadien a élevé ce monument. In fact, more than 66,000 Canadians died in action, or of their wounds after the war—more than one in ten of those who had worn uniforms. Among the dead are many who have no known grave. Inscribed on the ramparts of the Memorial are the names of 11,285 Canadian soldiers who were posted "missing, presumed dead" in France.